By now, each division one team has played their minimum six games, comprising five regular season matches followed by either a relegation decided or a quarter final. This year’s league had plenty of surprises, with various teams overperforming, underperforming, or even doing both at different stages. In this article, we’ll be taking a look at how each team did in terms of that most crucial statistic: scoring. An easy way to quickly get an idea of how teams are doing is to assign them offensive and defensive ratings: In other words, how much did they score and concede per game? Though this ignores many factors, most importantly the quality of their opposition, it does help provide a rough guide to which teams are doing better or worse. Note that the following charts all only take regular time into account; games that went to extra time have their extra time ignored. This chart graphs the team by how many points they scored and conceded per game. 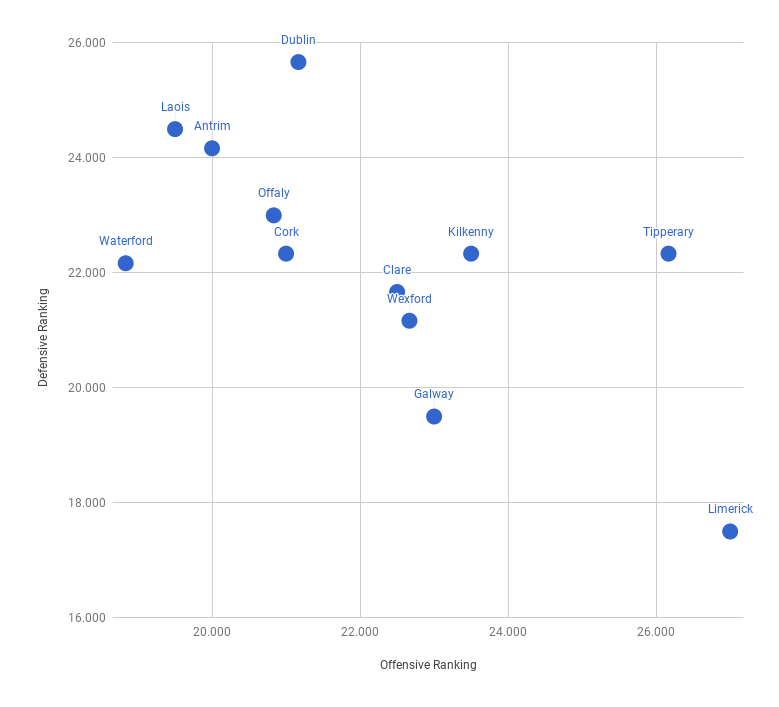 The ideal spot to be in this chart is the bottom left corner, currently occupied by Limerick. This corner is reserved for teams that are both scoring lots, while conceding very little. Though Limerick is in the highly desirable position of being an outlier in this direction, there are a handful of others that also occupy this quadrant; Galway, Tipperary, Wexford, Clare and Kilkenny (Tipperary, Kilkenny and Cork are all tied at 6th place defensively, just barely keeping them in the top half). Though failing to reach the quadrant of teams that are in the top half of both offensive and defensive ratings, there are a couple which are at least in the top half defensively; Cork and Waterford. Though this wasn’t good enough to make it to the quarter finals in division 1A, both of these teams know that they can at least rely on being solid on one end of the pitch. Finally, there’s the dreaded upper left corner, occupied by those who are in the bottom half of both scoring and conceding points (interestingly, there is no team which is in the top half offensively but the bottom half defensively). This quadrant is occupied, fittingly, by the bottom four teams in division 1B. Though the above gave us an idea of who’s doing well, it really does fail to adjust for the unequal schedules between the two divisions. Though Limerick have far and away the best scoring margin, their first game against a division 1A team resulted in a free taking contest, as they failed to get ahead after two rounds of extra time. Similarly, though Waterford struggled to score, it’s very possible that they would have fared better against some of the competition in 1B. In order to better represent how much teams overperformed, we looked towards the site’s BAINISTEOIR computer rating system. This program is able to provide estimates of the expected scoring margins of matches before they occur, allowing a comparison between how much a team was expected to win or lose by, versus how much they actually won or lost by. The above chart displays each teams’ expected and actual scoring margins after six games, as well as the difference between the two, and is sorted by the teams with the biggest performance above expectation. Rather than giving the previous section’s chart some extra context, this has only emphasised just how strong Limerick’s league has been to this point, and their leap in ability from 2017 to 2018 is definitely notable. Similarly, Wexford are another big outlier, massively outperforming their expectations in their first year back in the top division. Other teams that did better than expected include Offaly, Cork, Clare and Tipperary. On the other side of the chart, Antrim, Kilkenny and Laois all performed moderately below expectation, while concern definitely needs to be raised for Galway, Dublin and Waterford, all of whom had scoring margins well below what was predicted. None of this is too surprising, giving their current situation; Galway failed to gain promotion again, lost their quarter final, and had some near-upsets against teams like Antrim. Dublin only managed to reach 4th place in division 1B, and suffered heavy losses to Tipperary, Limerick, and, most surprisingly, Offaly. Waterford were relegated, and scored fewer than 20 points in four of their games. Not all teams pace themselves equally. Sometimes the key to beating an opponent is to hold them off for key periods where they usually do most of their scoring, and retaliating at the periods where they usually fade. 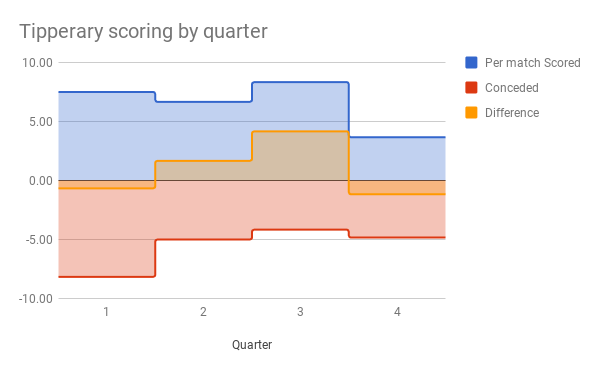 The chart above displays how much each team added to their scoring margin by quarter, on average across six games. This helps give us an idea of when they usually make their move to win, where they usually begin to fade, and whether or not they tend to be steady across the entire match. Despite their huge scoring margin per game, Limerick were more or less neutral in the first 20 minutes of their games. It’s only after this point that they tended to pull away from their opponents. In contrast, their neighbours Clare did the exact opposite; they put up a massive scoring margin in the first quarter, then would attempt to cling on to this for the remaining three. Clare actually scored more in the first quarter of their matches than they did in second halves. Most teams have notable trends like this; Galway start the second half slowly, but are otherwise strong. Tipperary start and finish slowly, but they make huge strides in the middle of the game to put teams away. Cork are solid for most of the game, but were frequently killed in the latter part of the first half, and often failed to recover. The only team that was truly steady across the game was Offaly; unfortunately for them, they had a slightly negative scoring margin in each portion of the game. For a more in depth look at each team, the following gallery provides how much each team scored and conceded in each quarter, per game. Another valuable piece of information is how teams score; if a team relies heavily on frees but struggle from play, you may want to ease off them slightly, for example. The following chart breaks down how each teams scoring margin, per game, was influenced by the various sources of scores. All points, scored and conceded, were divided into those scored from play, from frees, from penalties, from 65s, and from sideline cuts. Limerick, the team with the best scoring margin, is understandably performing well from all areas; their only negative is giving up half a point per game more in 65s than they score from them, and on the other side they score a massive 8 points more from play than their average opponent. Other teams which rely heavily on score from play include Tipperary, Galway, Wexford and Clare. Like Limerick, Tipperary have also performed well across all areas, but have conceded a little more from penalties and 65s, perhaps indicating some potential weaknesses in their full backs. Galway, Wexford and Clare, despite doing very well from play, all underperform when it comes to frees. Clare in particular struggle in this regard, giving up almost the equivalent of a goal per game in frees conceded versus scored. Though they have the third highest difference in points from play, their net scoring margin per game barely hovers above zero as a result. It’s difficult to say whether these three teams struggle to draw frees, or simply to score from the ones they get, but regardless, it’s an issue which probably needs to be addressed by all of them. Kilkenny are a perfect example of the opposite problem: though they concede more points from play each game, they more than make up for it through making their frees, penalties and 65s, resulting in one of the better scoring margins of the 12 teams examined. Cork, Laois and Offaly have also used scores from frees to help them stay in games, but have not scored enough from play to avoid a negative scoring differential. Waterford, Dublin and Antrim are all in the unfortunate position of not being able to clearly diagnose what’s wrong with their scoring; they’re all performing worse or similarly to their opponents in every area. Dublin, in particular, have failed to make gains in any one area, while Waterford and Antrim at least have some negligible positives. Momentum is a controversial topic in the area of data analytics. A regular topic is that of the ‘hot hand fallacy’, and how, just because a player already made a lot of their shots, it doesn’t mean they’re more likely to make the next one. However, while this does appear true over a long enough time, it’s undeniable that certain teams appear to be streakier than others. While some teams will score at regular intervals, others will rely on streaks of scoring. The above chart displays the standard deviation of the length of time between points scored and conceded. The larger the value, the greater the variance between when points are scored, and the more ‘streaky’ the team is. Comparing with the scoring margin graphs, it appears that the best teams score on a regular basis, while forcing their opponents into streaks. The teams with the best scoring margins, such as Limerick, Tipperary and Galway, fall neatly into this category. 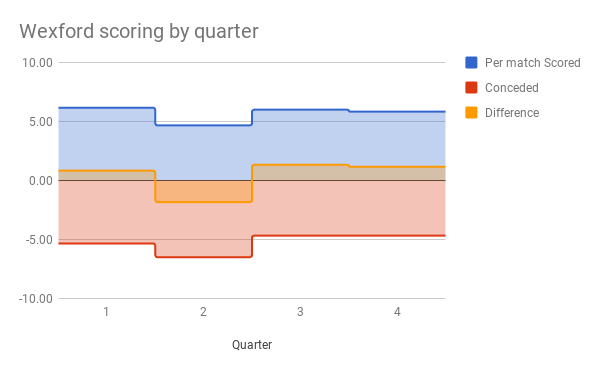 The alignment isn’t perfect, however: Clare have had a solid scoring margin, but have scored very irregularly (as we saw above, they tend to rely on going on a big run in the first quarter of matches. They also struggled with scoring from frees, which partially explains why their scoring isn’t steadier throughout). 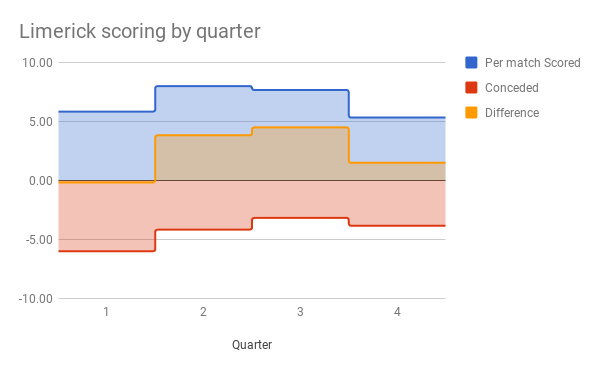 Wexford have been extremely regular, and forced their opponents off rhythm, yet don’t have as positive a scoring margin as some other teams; possibly when their opponents are scoring, they’re scoring too much, or possibly Wexford will revert to the mean and begin to win by more. On the other side of the graph, the teams which allow their opponents to score most regularly definitely correlate with the worst scoring margins. Offaly and Dublin allow their opponents to score like clockwork, and have both had multiple blowout losses. Oddly, Laois, the team with the poorest total scoring margin, are not nearly as bad in this regard. However, it’s possible that they’re scoring on a regular basis, but with scores too far apart, and it’s possible that they’re conceding irregularly because opponents go on scoring flurries in between their normal rhythm. Waterford remain an outlier; though not the worst defensively, their own scoring was massively more sporadic than any other team. Looking at the scores isn’t the most in depth form of statistical analysis; it almost feels too simple, because of course the team with more points wins the game. However, by breaking down when and why the scores happen, or don’t happen, we can get more of a feel for a team, and more of a feel for their strengths and weaknesses: Laois or Kilkenny both had their struggles this season, but concede too many frees to them, and you might find yourself behind. You might survive the opening against Limerick or Tipperary, but you need to be ready for them to make a real push soon after. Clare may get off to an early start, but keep taking your points and your easy frees, and soon the gap could be reduced. Every team has their patterns, and these patterns could be hints of where these teams could win or lose their games going forward. Though only the result really matters, having a better winning margin can be a sign of a team in good health: There are only two rounds of the league left to go, and it’s no coincidence that the four remaining teams are all in the top five of score difference.